With only two days in Lisbon, my friend and I were looking to pack in as much as we could. She emailed me asking if one of our activities might be to have dinner at Belcanto, a two-star Michelin restaurant. 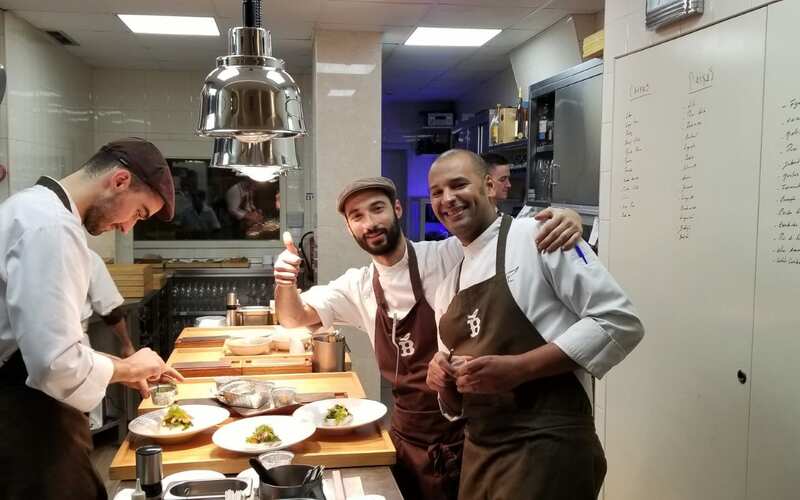 The 2019 Michelin Stars had just been announced and Portugal has twenty-six Michelin starred restaurants, twenty which have one star and six which have two stars. Belcanto had yet again received two stars. I knew it might be a bit of a splurge but I could not say no. Of course, the challenge would be getting a reservation. We were only two weeks away from going on our trip and the website only had an email address on it. 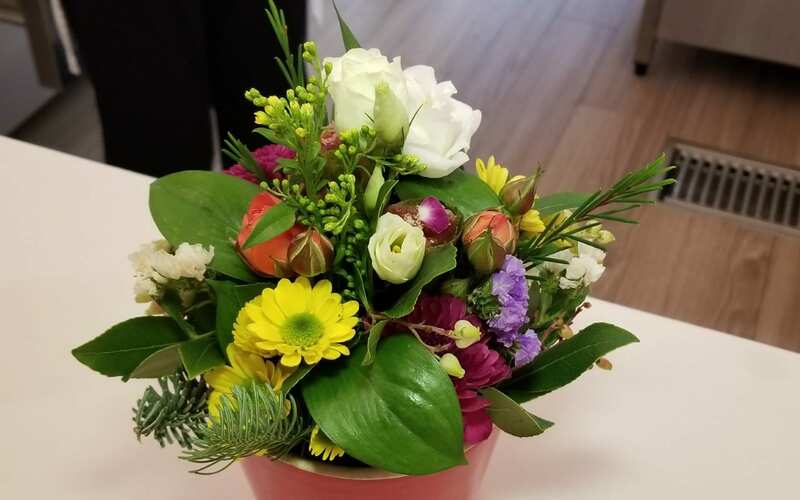 I reached out to a friend of mine in Lisbon who works for the elegant Palacio Estoril Hotel and thought he might be able to find their phone number and call from the same time zone. 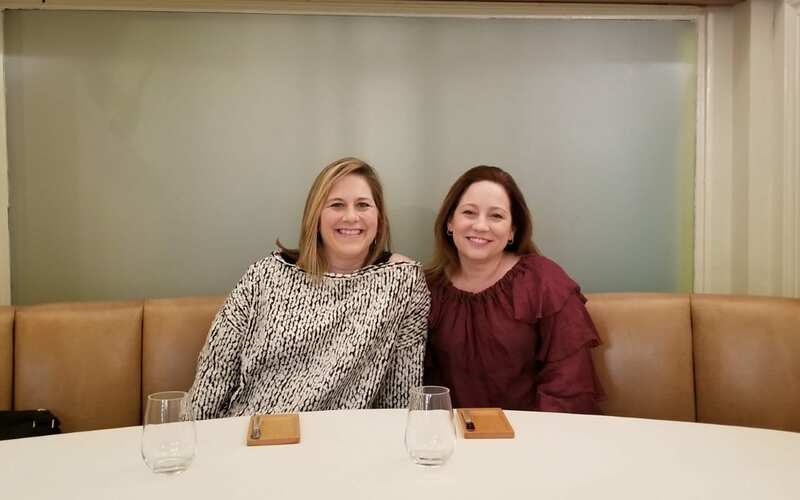 The next day, I had an email from him telling me that the restaurant was completely booked BUT he was able to get us a seat at the Chef’s Table. We would experience a tasting menu with wine pairing. We immediately booked the reservation. 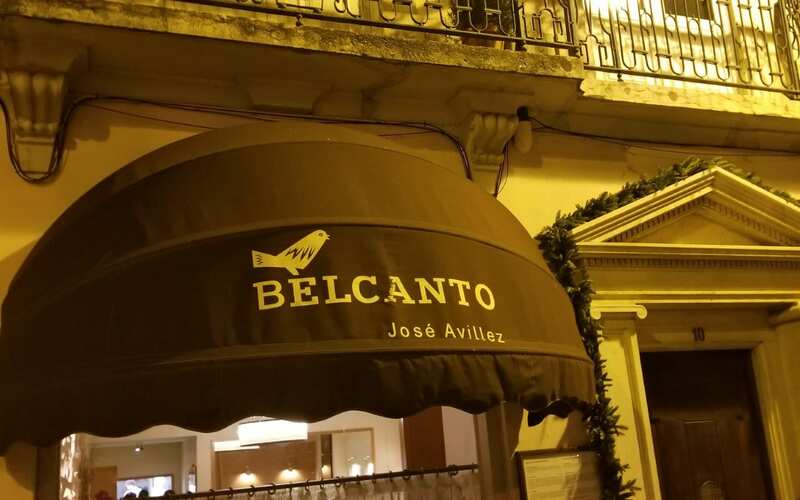 Belcanto is owned by celebrity chef José Avillez. 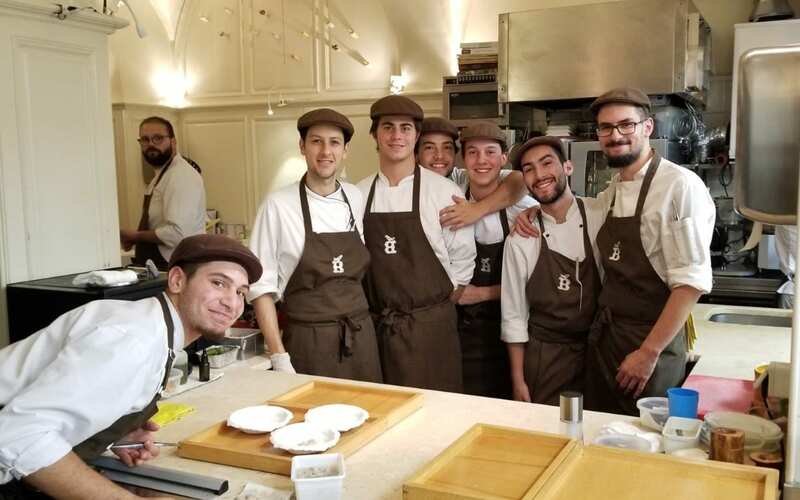 Avillez has worked with gastronomic superstars Ferran Adria, Eric Frechon and Alain Ducasse, as well as received his first Michelin star at Taveres, Lisbon’s oldest and grandest restaurant. Avillez took over Belcanto in 2012. 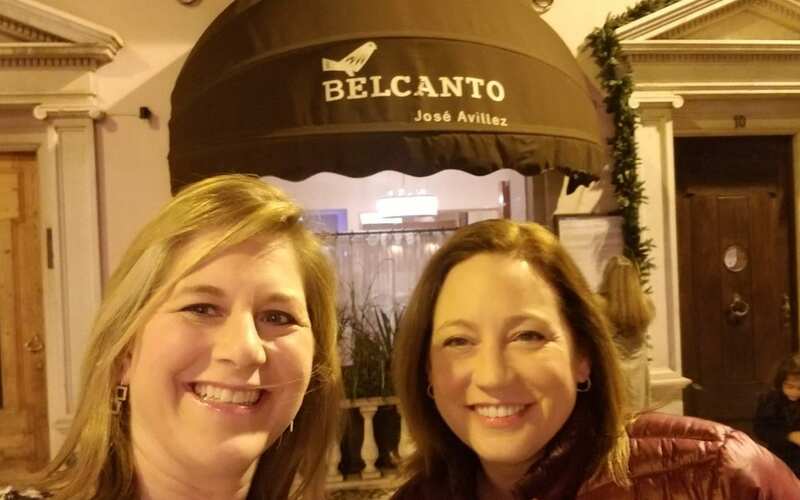 An award-winning restaurant since 1958, Belcanto had been a late night gathering place for artists and opera patrons who frequented the nearby St. Charles theater, as well as a “gentleman’s club” where dancing girls performed on a small stage. Avillez renovated it into a subtle and sophisticated intimate restaurant with only 36 seats. Two weeks after booking our reservation, and after a week of wine tasting in the Dão region, we arrived at Belcanto. We were greeted at the door and our coats were taken from us as we were escorted through the dining room into the kitchen. We walked past the chefs who all waved and welcomed us as if we were old friends. We entered another door where we came upon our table, set for two. 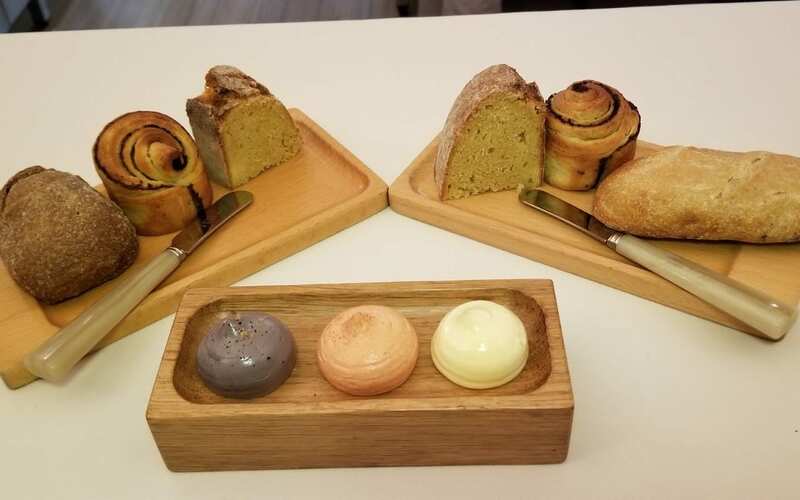 We took our seats and in front of us was the entire kitchen, with the pastry team closest to us. There was a sense of serenity in the kitchen as the cooks all worked at the various stations. 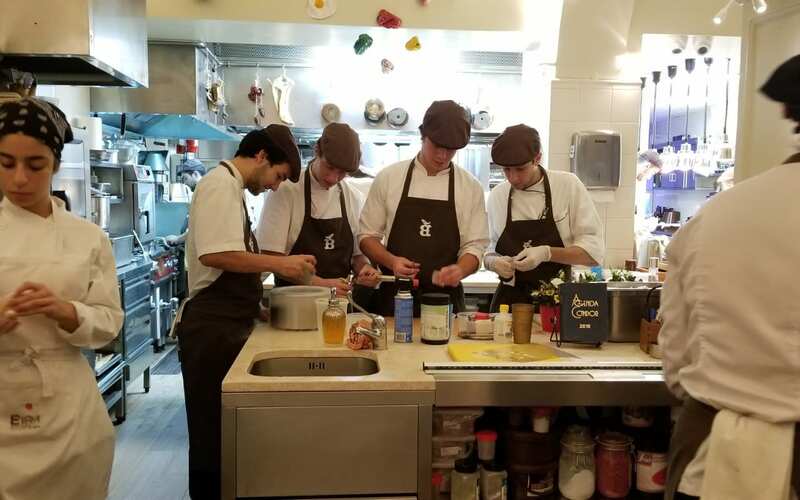 There was silence but when the chef spoke, each and every member of the kitchen would say “chef” out loud, almost in unison, to acknowledge that they heard him. As we settled in, our host Luis, or rather our conductor for the evening, welcomed us. He was funny and charming and his words were like poetry as he explained that we were embarking on a journey with familiar flavors but new textures and some surprises. To begin, we were served a Dirty Elderini with a spherical olive El Bulli, inspired by Avillez’ time working at El Bulli in Spain. 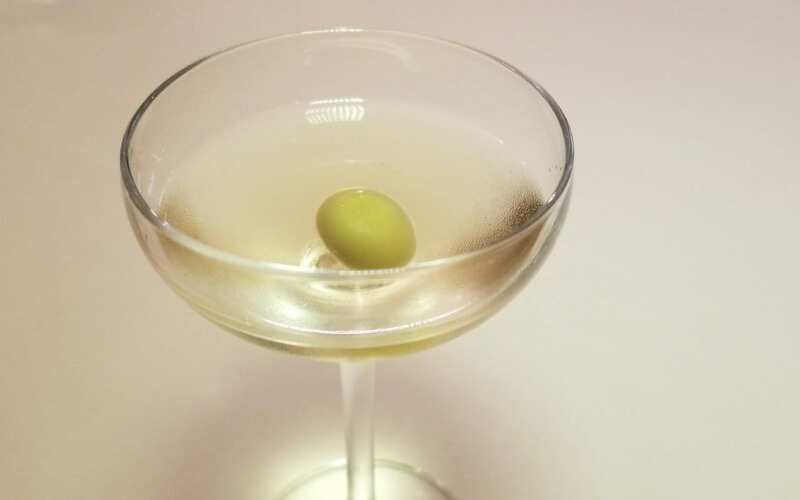 A clean drink with a hint of sweetness, the El Bulli olive was filled with vermouth and melted in the mouth. It was a refreshing drink to start our evening. The sommelier then came to our table to present the first wine for the evening. We began with the Filipa Pato 2017 Nosso Calcario Bical from Bairrada, a region between the hills of the Dão region and the Atlantic Ocean. Bical is the primary white wine grape of both Bairrada and Dão and produces an aromatic and well-structured wine with soft acidity. The delicateness, freshness and intricate acidity made for a perfect pairing for the first few dishes. 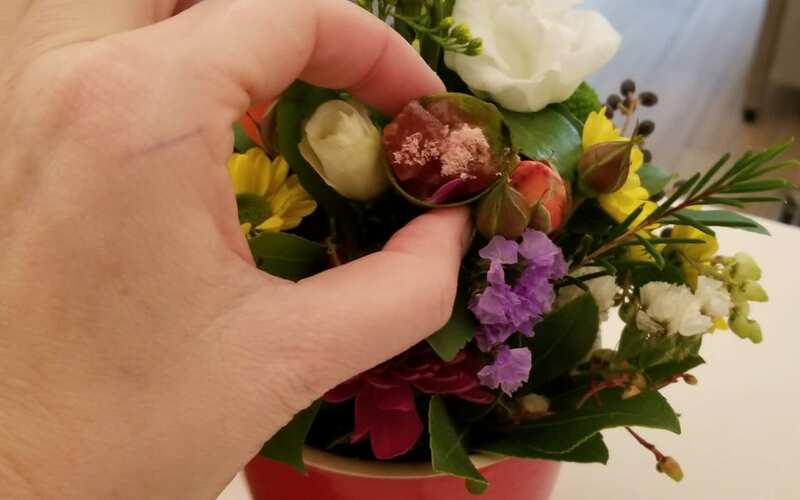 We began with the amuse bouche, three striking dishes that were almost too pretty to touch. 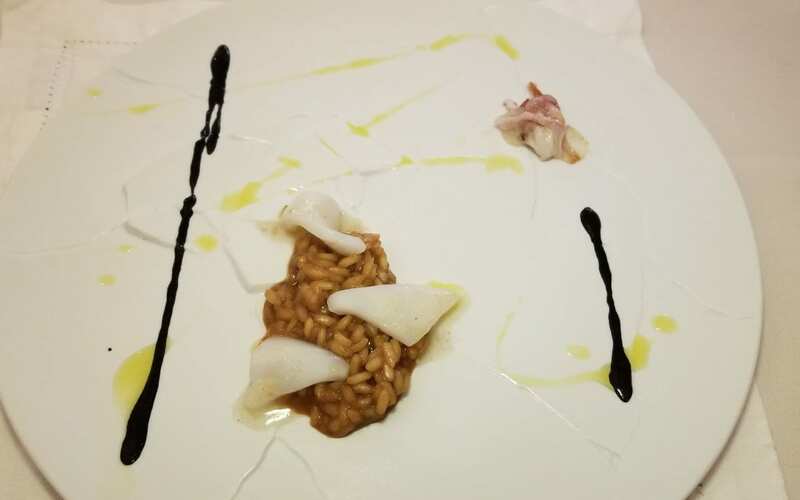 The Cod and Chickpea “Stones” were black and white to represent the black and white tiles on the ground throughout Lisbon. The most popular dish in Portugal is cod and the Portuguese will say that they have 365 recipes, one for every day of the year. I also head some people say that there are 1001 recipes with cod. 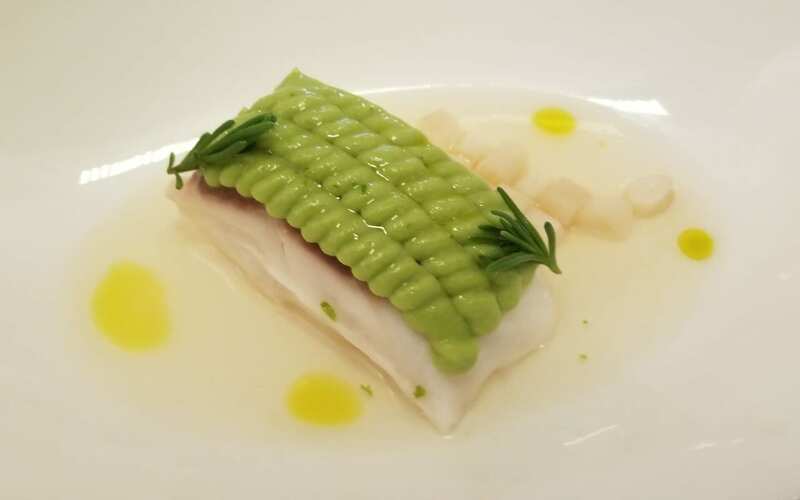 Whatever the true number is, cod is served numerous ways in Portugal and at least one of the recipes is of cod with chickpeas. 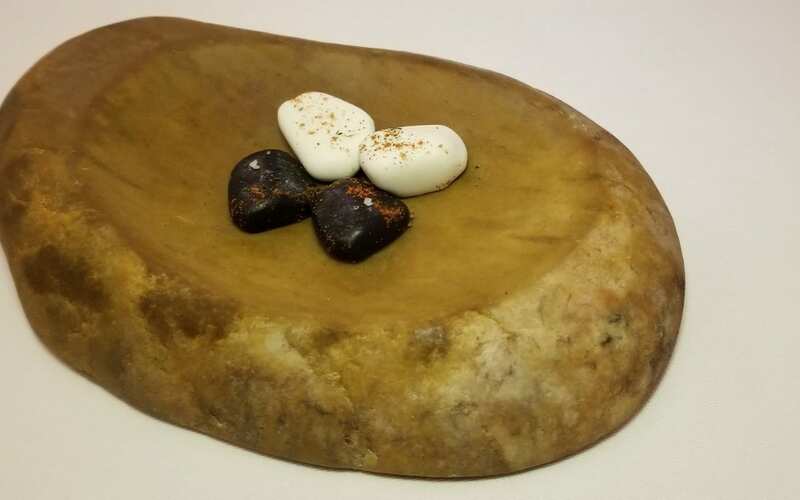 For our dish, the black stone was chickpea with a cocoa shell and the white stone was cod with a white chocolate shell. Another typical product found in Portugal is canned fish, an industry that dates back to 1853. One type of canned fish you can find is tuna from the Azores. Azores is an island off of Portugal where a number of tuna species are found on the migratory route. In addition to canning this tuna, the tuna steaks are one of the most traditional dishes from the island. 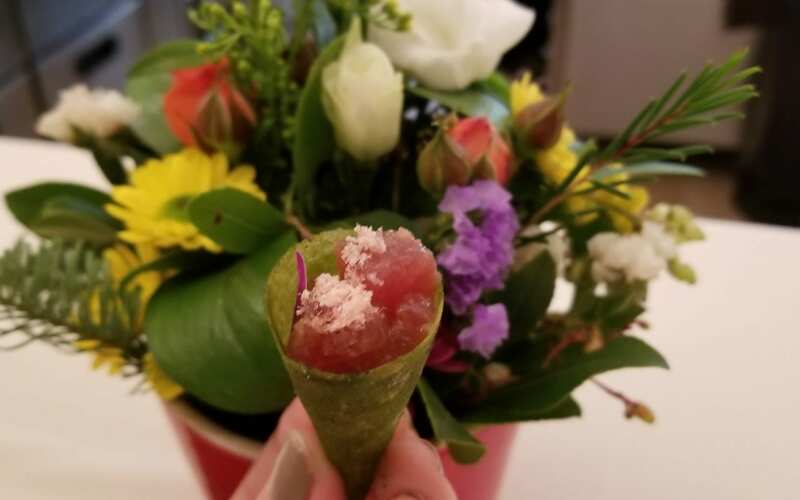 Our Azorean Tuna “Bouquet” was a bouquet of flowers and tucked inside was a tuna tartare cone. 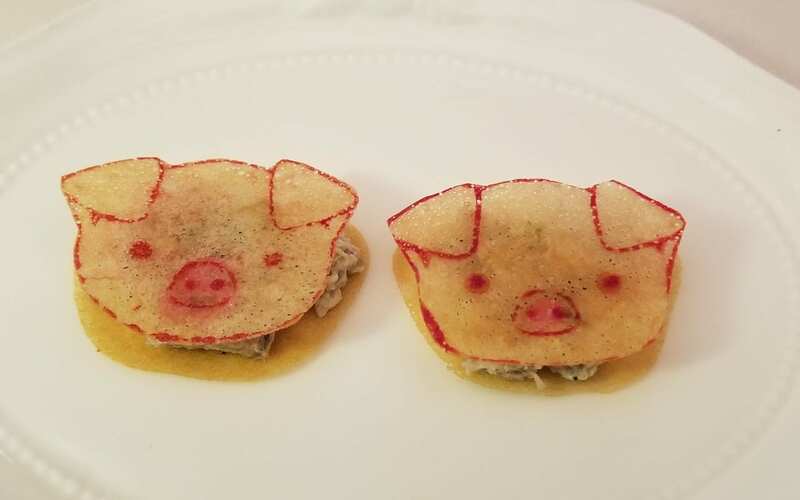 The third plate of our amuse bouche were two little Pig Heads and inside the delicate, thin crisp wafer was pigs head terrine, otherwise known as head cheese. 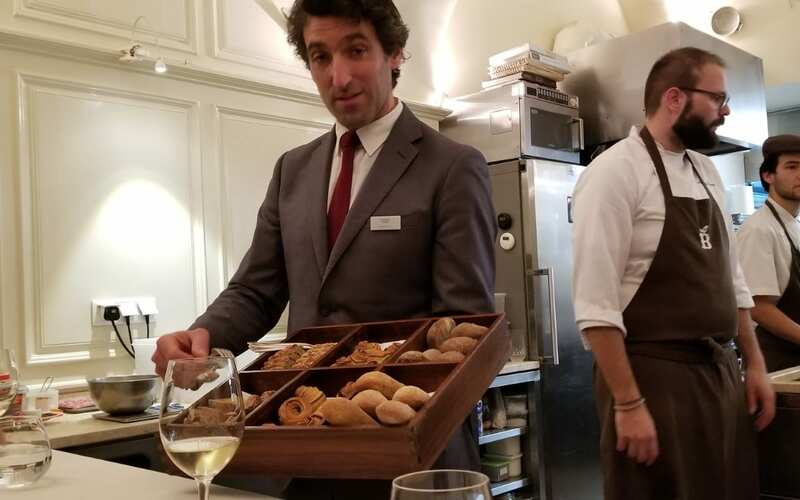 Luis then served us a selection of breads (whole grain, olive, cornbread and French) with three butters. 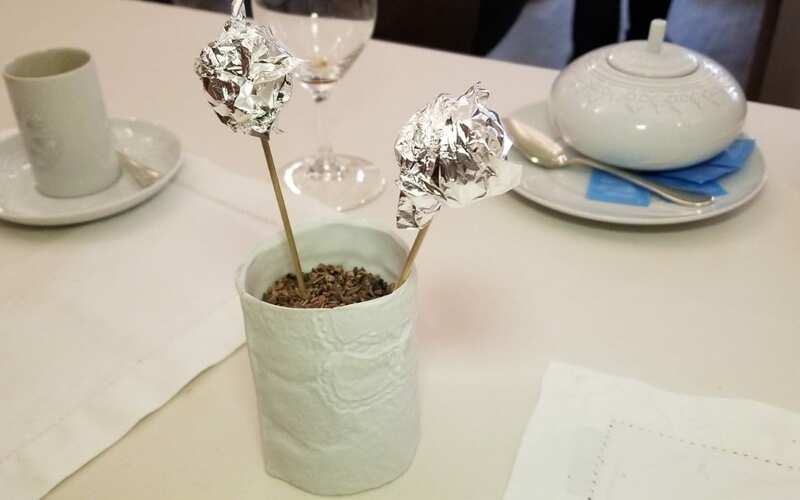 There was a butter made with rosemary ashes and smoked sea salt, a butter of sausage and tomato and a bright yellow butter made from milk from the Azores, a region famous for its cheeses. Our conductor Luis returned to our table with our next dish. He explained that we started with explosive olives and then enjoyed rolling stones. And now he was bringing snow from the mountains of Portugal to us. 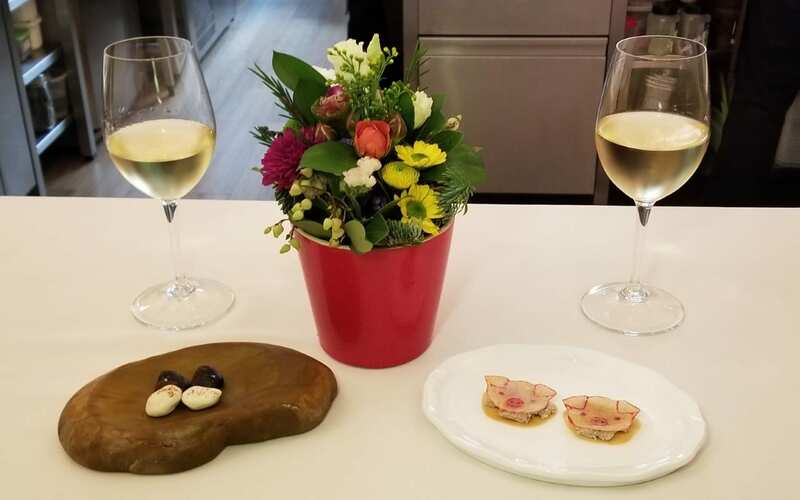 More specifically, the dish was Smoked Horse Mackerel slivers with cod’s liver, pickled flowers, pearl onions and crispy bread. The snow melted in the mouth and tasted like fresh tomato soup. From the snow, we moved to the green with Bulhão Pato Clams Ceviche. Bulhão Pato was a poet from the 19th century and the traditional dish of clams in olive oil, garlic, lemon and cilantro is named after him. 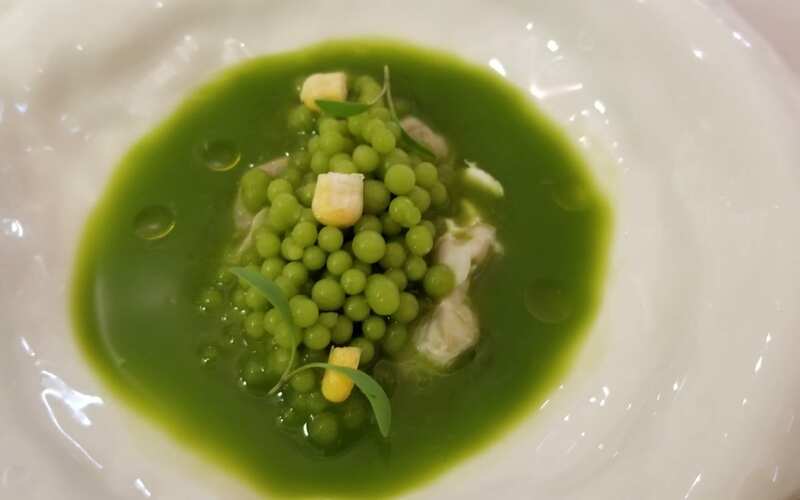 Here we had a modern twist on the classic dish with clam ceviche in a green soup with small nitrogen beads of cilantro and freeze-dried corn. Our next wine came from Vinhos Verdes, the wine region in the far north of Portugal. The wine is often referred to as “green wine” but not because it is green, but rather they are young wines. Alvarinho (also known as Albariño in northern Spain) is considered one of the finest grapes in the region. 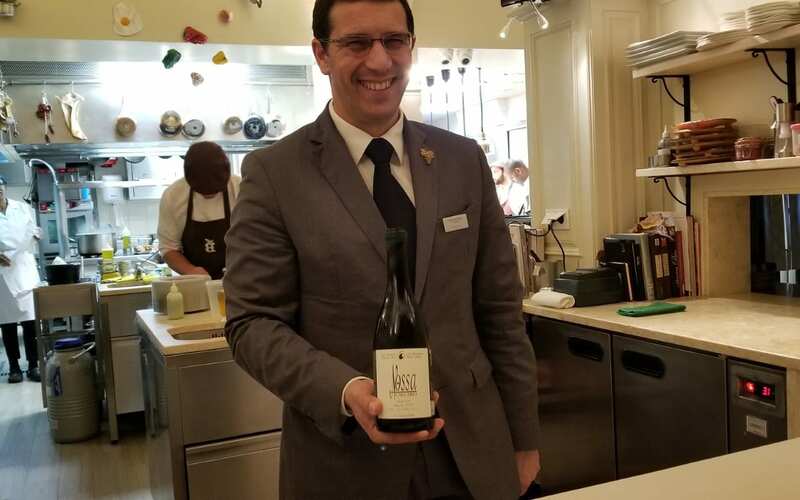 The Soalheiro 2017 Terramatter Alvarinho has a aromatic nose of flowers, peach, apricot and citrus and on the palate it has vibrant acidity and minerality that would cut through the richness of our next dishes. Given that Portugal is a sea-faring nation, fresh seafood and fish play a significant role in the local cuisine. With the Alvarinho in our glass, we were ready for more courses of fish. 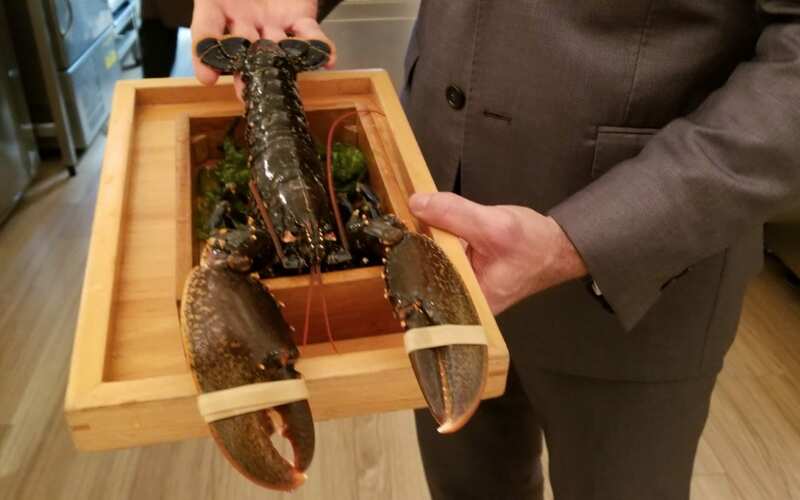 Luis then presented us with a large blue-tailed European lobster, who we named “Luis”. 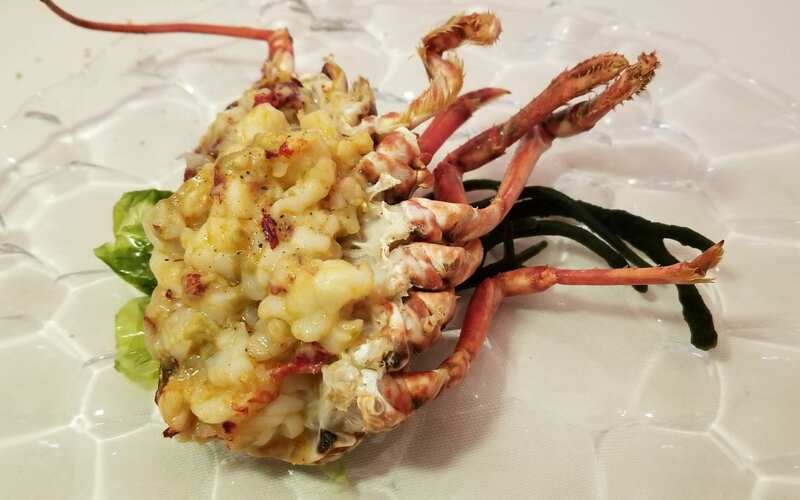 A few minutes later, we were served Grilled European Lobster Tartare. It was rich and flavorful and the acidity of the wine made for a perfect pairing. 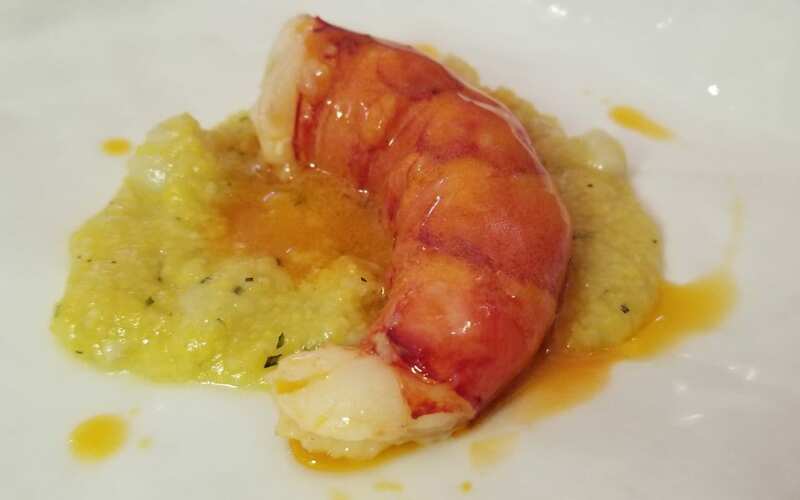 The body of the shrimp was served with “xerem”, a maize porridge with cod’s swim bladder and Hart’s pennyroyal (mentha cervina). 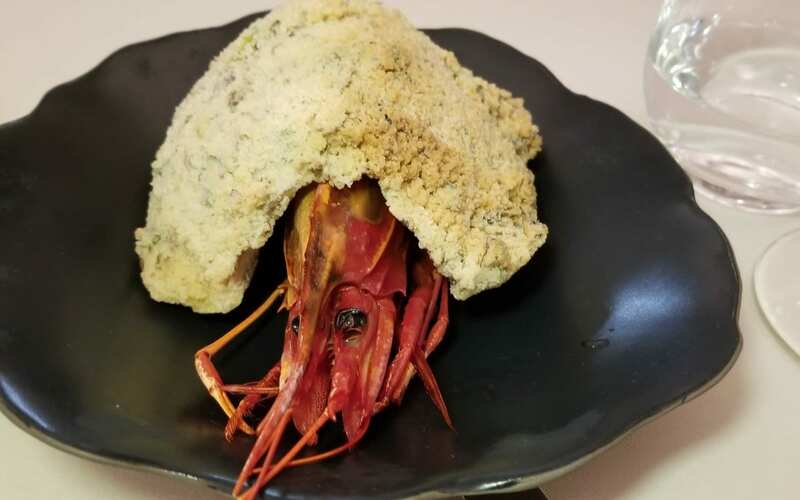 Its head was presented in a crust of beetroot salt. The crust was removed and we were able to enjoy the meat and juices in the head, considered to be a delicacy. As we continued to enjoy seafood, our third wine of the night was a white wine from Lisboa (Lisbon). The vineyards of Lisbon are west and north of the city and run up beside the Atlantic. Therefore the coastal climate and wind influences the wines. The Quinta da Chocapalha Branco 2008 is a white blend of indigenous Portuguese grapes. With some oak influence and a few years of aging, this ten-year-old wine has texture and body but still maintains is brightness and acidity to stand up to some heartier dishes. 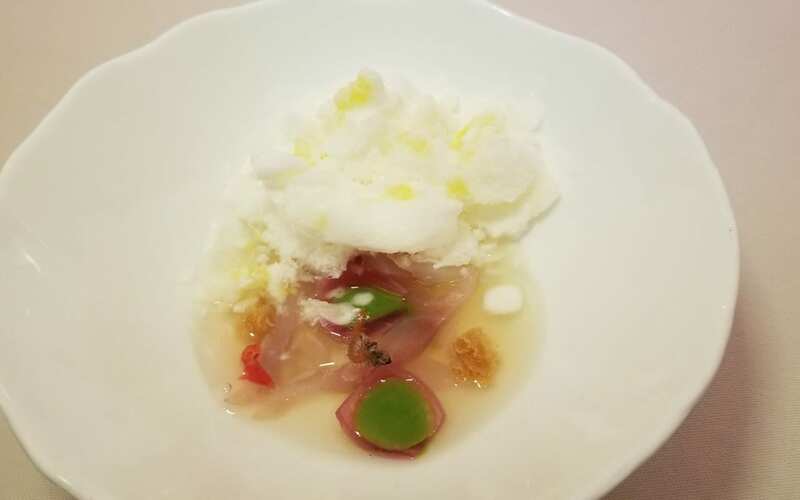 The next dish was inspired by the classic Portuguese cozido, a boiled dinner or Portuguese stew, or as the French say, a pot-au-feu. It is a hearty dish using a variety of meats, charcuterie and vegetables to create a rich broth. 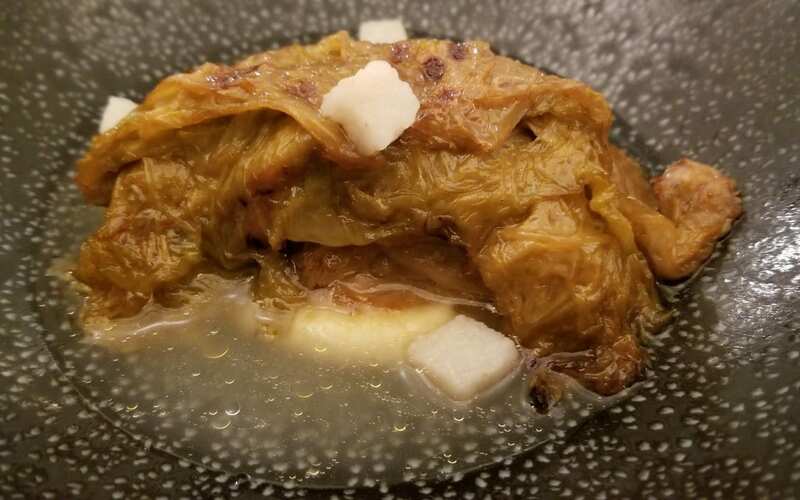 Our Coal Roasted Cozido was made with cabbage and the small white cubes were pork jowl. 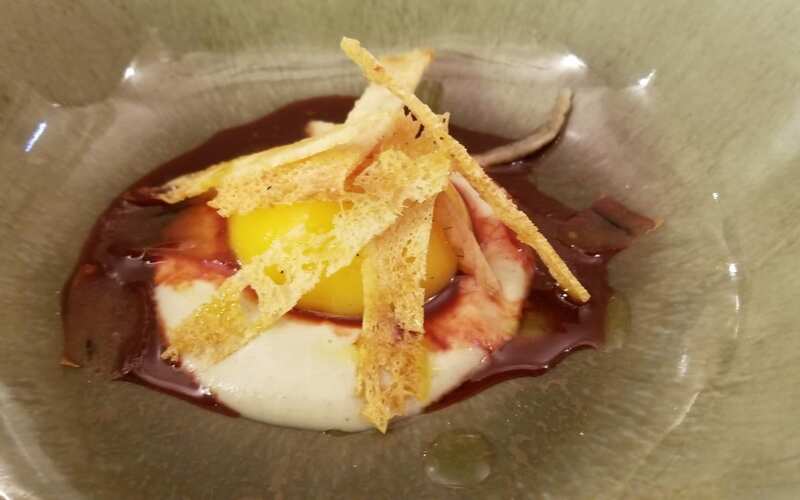 Looking like a sunrise, Luis sang “Here Comes the Sun” as he served the LT Yolk with sunroot puree, “farinheira” of roe, eel and “cabidela” sauce, a reinterpretation of some very traditional Portugeuse dishes. Farinheira is a Portuguese smoked sausage typically made from wheat flour, pork fat and seasoning but in this dish it was a fish egg sausage. And cabidela is a Portuguese dish made with chicken or rabbit cooked in its own blood with water and vinegar. For this dish, the cabidela sauce was made with beetroot, instead of chicken blood (there may have been a little bit in there). Sea bass is an everyday fish in Portugal. But, the Sea Bass with smoked avocado, pistachio oil, lime zest and dashi was anything but everyday. The fish was delicately cooked and the avocado mousse was creamy. Combined they melted in the mouth. On the side, the flavorful little white squares were cuttlefish. When the sommelier brought us the CARM 2010 from the Douro, we knew it was time for some meat dishes. 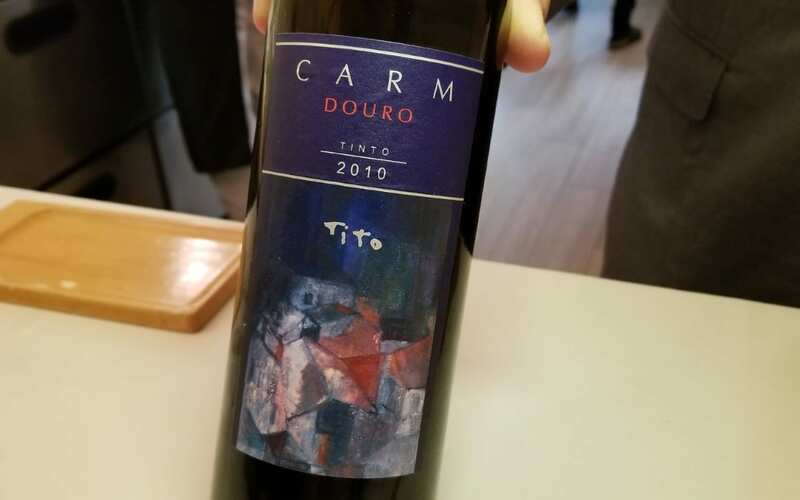 CARM stands for Casa Agrícola Roboredo Madeira and it comes from six properties in the Douro superior, the upper part of the Douro nearest to the Spanish border. The area is a warmer and drier area than the rest of the Douro and this red wine, a blend of Sousao, Tinto Cao and Touriga Nacional, has aromas of black fruit and vanilla. The tannins are soft and the wine has medium acidity, an ideal balance for meat dishes. The first dish was not exactly meat but it was rich and flavorful and intense enough to stand up to red wine. The Grilled Squid stuffed with its rice, lemon zest, bone marrow and pancetta emulsion was a piece of art. The plate itself was three dimensional as it was not completely smooth. The rice was rich and the squid tender and the pancetta emulsion literally melted in the mouth. We were already rather full when the meat dish arrived. 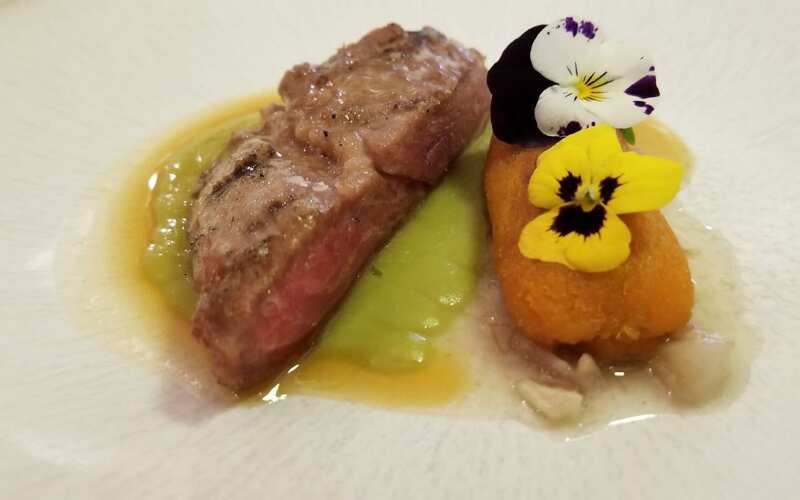 It was a piece of medium-rare Pork from the Alentejo region with red paprika and bread mash, small fava beans and pig’s trotters with cilantro. 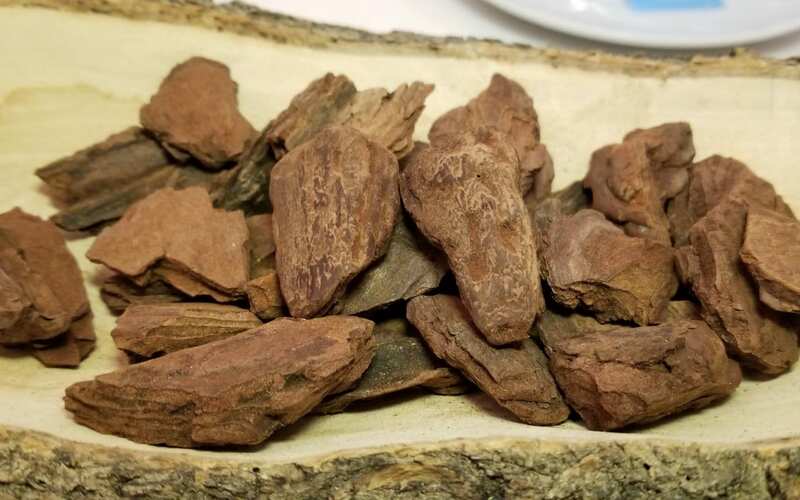 Typically pork cannot be eaten medium-rare but the pigs in Alentejo are fed cork oak acorns and the meat is so tender and delicate that it can be cooked medium-rare. We were then served a little ice cream cone but do not be fooled. This was deceiving. 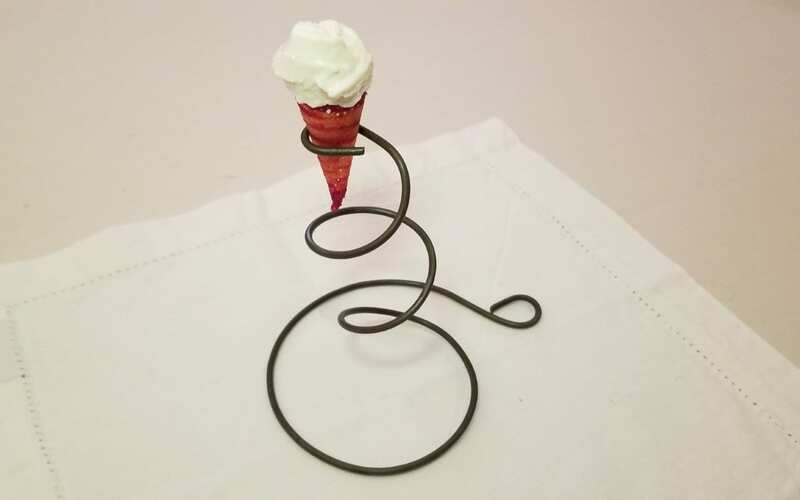 It was no ordinary ice cream cone but rather a Cured Ham Cone. The whipped cream in the cone was actually smoked pork. I do not know how they did it but it was delicious. As we began to transition into our dessert courses, we were served a plate that we were not sure if it was sweet or savory. It was Choco, Chocolate and Cuttlefish Ink, or Tinta de Choco. 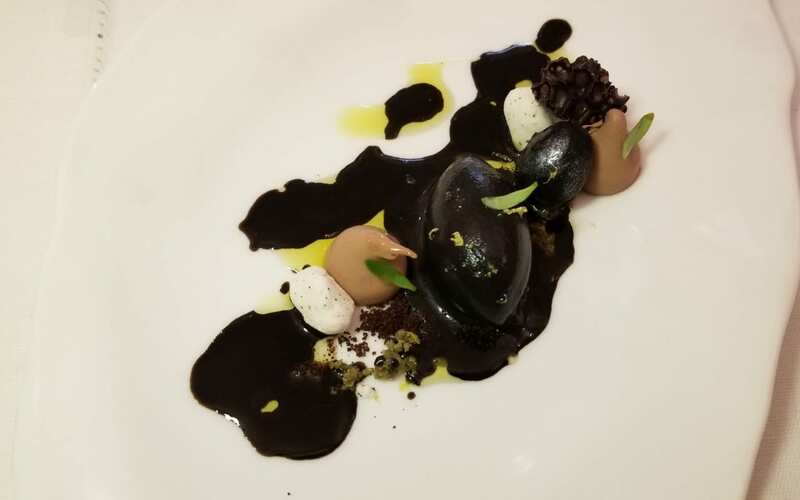 Choco is Portuguese for cuttlefish and the dish consisted of seaweed, olive oil, hazelnut, coriander and cacao with the black cuttlefish ink. The dish was not sweet but rather neutral and was the stepping stone into dessert. After watching the pastry chefs closely all night, it was finally time to indulge in the art that they had been creating. But first, we were served the wine to be enjoyed with dessert. As we were in Portugal, a fortified wine was expected. But we were not served Madeira, Porto or Muscatel de Setúbal but rather Quinta da Bela Vista NV Carcavelos Fortified Wine. 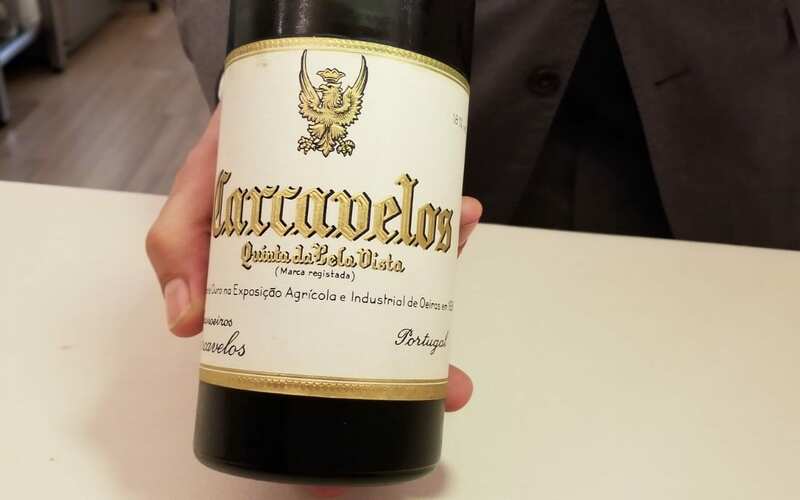 Carcavelos is a traditional Portuguese wine region at the very tip of the Lisboa region. Made from the grape Galego Dourado, the wine is a golden amber color. On the nose, the aromatic wine has notes of spices, dried fruits and nuts and vanilla. It is full-bodied on the palate with flavors of figs and raisins and finishes with elegant acidity. The first dessert was a Traditional Sweet Rice, a pudding with cinnamon, lemon and cornbread sauce. On top was a delicate, hand-made leaf of cinnamon and flour. 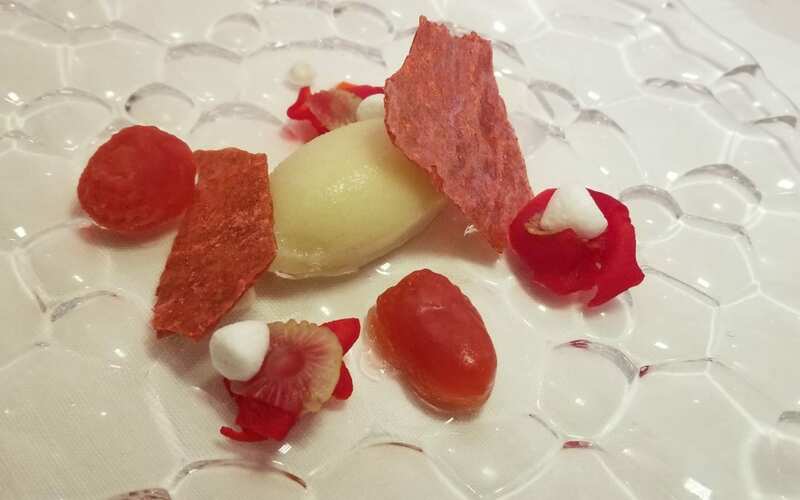 Our final dessert was a refreshing and light Strawberries, Lychee, Roses and Yuzu. The flavors were straight-forward but as Luis had warned us at the beginning, the textures would be a surprise. We were not yet finished as it was time for the Petit Fours. Had we been sitting at a table in the dining room, they may have come out at one time on a single plate. 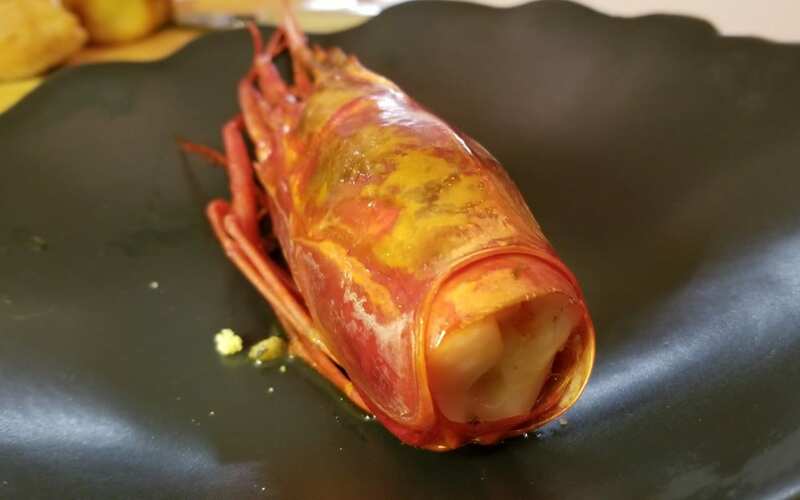 But, we were served each bite, one at a time, which allowed us the opportunity to marvel at each creation. 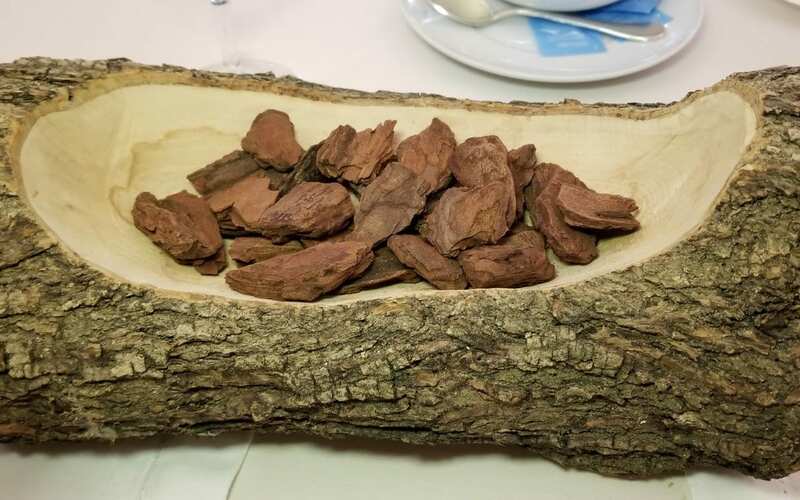 We started with the Chocolate Bark, which was served in the bark of a tree with actual bark. We were asked if we could pick out the edible pieces and had to look very closely as the chocolate pieces were so realistic looking. We found the two pieces and placed them on the top of the pile. Again, they were so realistic looking! 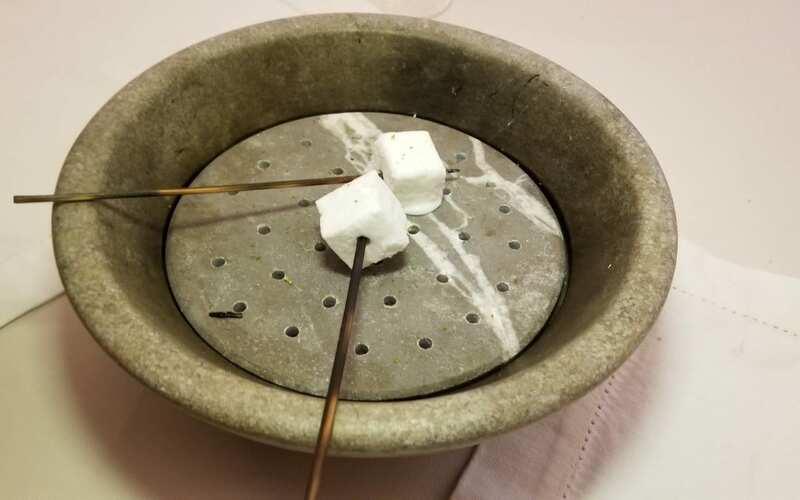 The Marshmallow with Kaffir Lime was served in a hot stone with smoke underneath. 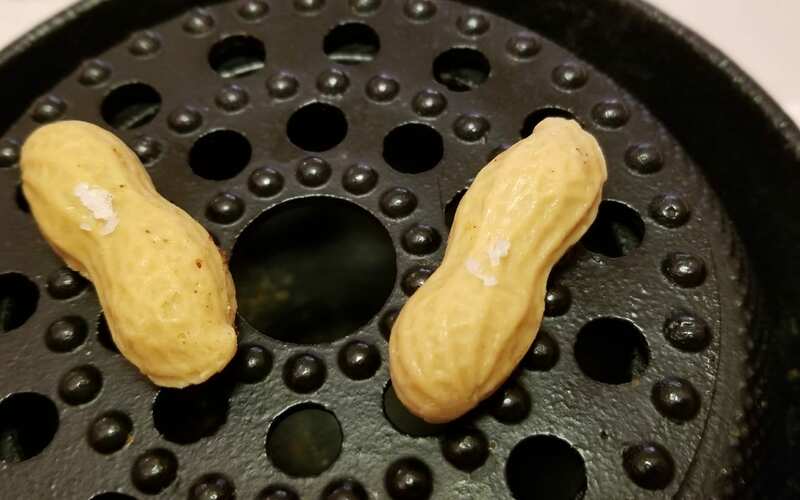 We had been watching the pastry chef make the Peanuts all evening. The recreated peanuts were peanut butter with dried kimchee on top. Portugal produces a lot of olive oil from the olive trees planted throughout the country. 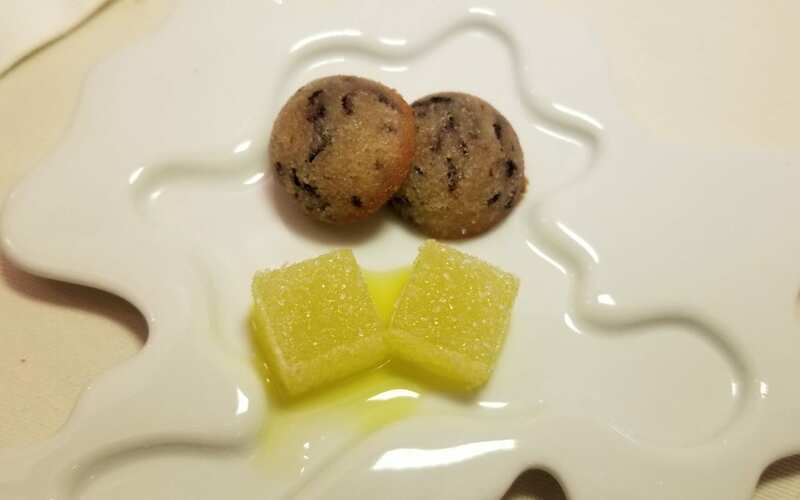 We enjoyed two little bites of an Olive Oil Gelee and an Olive Financier. 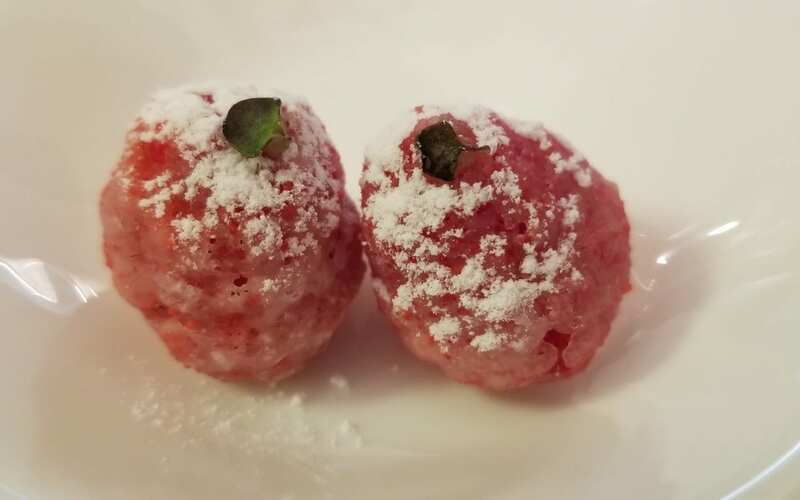 Like the peanut, the raspberry was not a simple fresh berry but rather, after some molecular gastronomy magic, it was a Raspberry with Wasabi. The final bite of the night was Chocolate and Hazelnut in Edible Silver. It was a magical bite. Our incredible meal had come to an end. 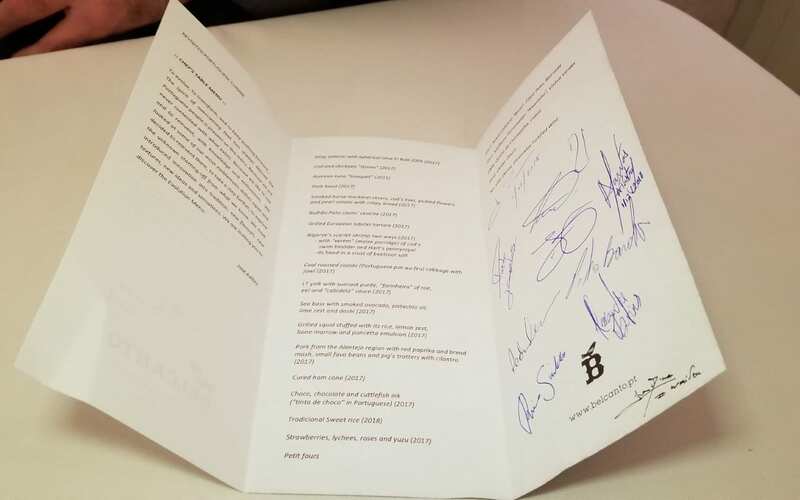 To remember our dining experience, we were presented with the full menu and all of the chefs had signed it, as well as a personal note from our conductor Luis that read: “What gets you into a great gastronomic adventure it’s what you think you know for sure, but it just ain’t so.” Not only was the meal itself a journey but it felt like we had traveled through Portugal, learning about traditional ingredients and dishes and then enjoying them in a new way. 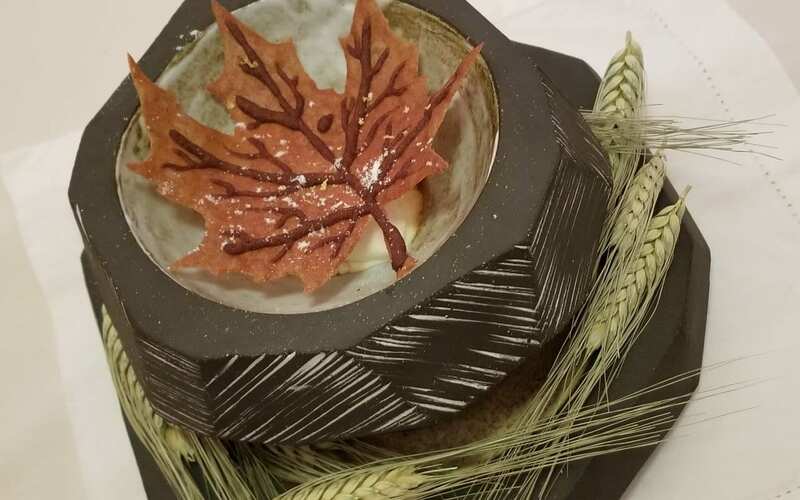 It was the personal touch and a perfect end to a magical meal and that is why dining at Two-Star Michelin Restaurant Belcanto in Lisbon is the Please The Palate pick of the week. This entry was posted in Food, Lifestyle, Travel, Wine and tagged Bairrada, Belcanto, CARM 2010, CARM 2010 Douro, Douro, Filipa Pato 2017 Nosso Calcario Bical, Filipa Pato 2017 Nosso Calcario Bical Bairrada, food, José Avillez, Lisboa, Lisbon, Lisbon restaurant, Michelin Star, Michelin Stars, pick of the week, Please The Palate, Portugal, Quinta da Chocapalha 2008, Quinta da Chocapalha 2008 Lisboa, Soalheiro 2017 Terramatter Alvarinho, Soalheiro 2017 Terramatter Alvarinho Vinhos Verde, two-star michelin, Villa Oeiras NV Carcavelos Fortified Wine, Vinhos Verde by Allison Levine.